English physician and friend of the Jews; born at Somersby 1828; died in London Nov. 21, 1896. He received his degree of M.D. in 1854, and became an active member of the British Medical Association. He was knighted in 1893. 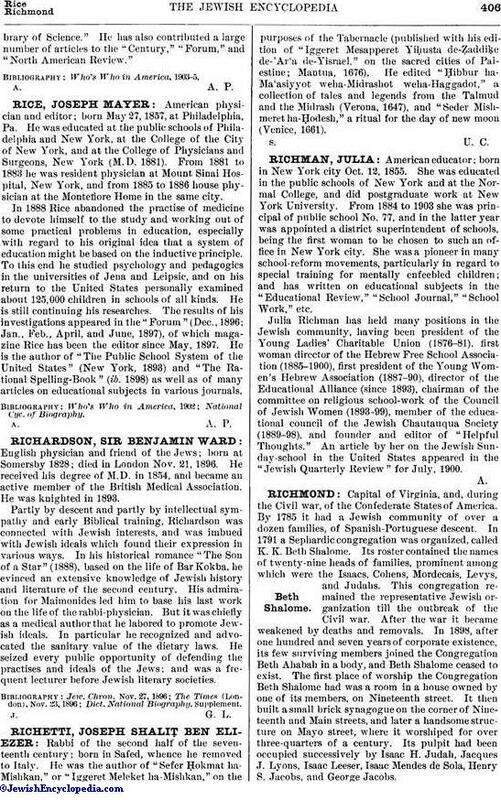 Partly by descent and partly by intellectual sympathy and early Biblical training, Richardson was connected with Jewish interests, and was imbued with Jewish ideals which found their expression in various ways. In his historical romance "The Son of a Star" (1888), based on the life of Bar Kokba, he evinced an extensive knowledge of Jewish history and literature of the second century. His admiration for Maimonides led him to base his last work on the life of the rabbi-physician. But it was chiefly as a medical author that he labored to promote Jewish ideals. In particular he recognized and advocated the sanitary value of the dietary laws. He seized every public opportunity of defending the practises and ideals of the Jews; and was a frequent lecturer before Jewish literary societies.